When our parents or grandparents kept chooks, they gathered the for eggs, and butchered poor layers for the annual roast or Coq au vin. Their chooks hung out in the chook shed eating vegetable garden scraps, and a rough sort of mash with the occasional grub tossed in. In contrast, our chooks these days are cosseted little princesses. Lo if anyone wanted to butcher their under-performing hens! 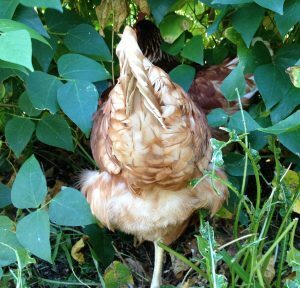 And, it seems most chooks get the run of the whole garden, which gives them the life we’d all dream of – eating, poking around and having fun every day. Ours have a new annexe attached to the back where they can enjoy the day without ripping the vegie patch apart. (They always manage to scratch up and eat the bits most important to me.) Better still for all concerned, the annexe is safe from hawks, snakes and rats. It’s made from 2” pressure pipe, star pickets and wire. The temporary shade structure keeps them cooler and dry as well. Very successful. I’d like to let you in on the things I grow in our garden to help keep the chooks fit, fat, fertile, and free of pesky lice and worms. 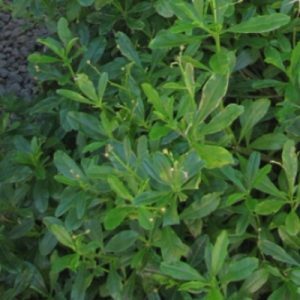 This attractive grey leaved plant growing to about 1 metre tall and 75 cm wide is sown around the outside of the chook pen. 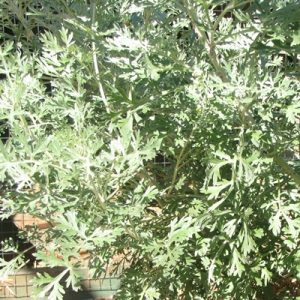 Wormwood is renowned for its ability to expel worms from the chook intestines, thus reducing or negating the need for worming treatment. BUT they do have to eat it. Ours will pick at the fresh wormwood leaves we harvest and throw into them. However, if your chooks haven’t grown up with wormwood, they may not touch it. You will need to dry and pulverise the leaves and mix a few teaspoons of it with their mash on occasions. I grow wormwood in the cottage garden bed for our pleasure. It looks soft and beautiful. Rue is a smaller growing plant than wormwood and is used for worming chooks too. It grows happily on the outside of the chook house. While all of our garlic comes into the kitchen for culinary use, the squashed bits left from crushing the cloves go into the chook water to expel worms. 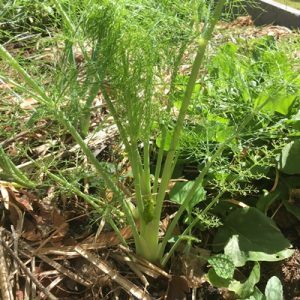 Fennel is an insect repellent for chook houses and this winter and spring I grew Florence fennel nearby. 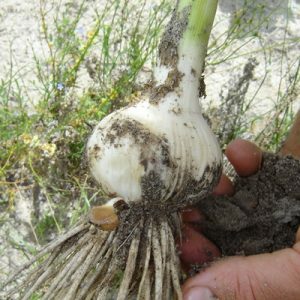 I love eating the bulbs with their aniseed flavour and the pungent foliage kept the lice and mites at bay. Bronze and Green fennel are even more pungent and most suitable for chooks. 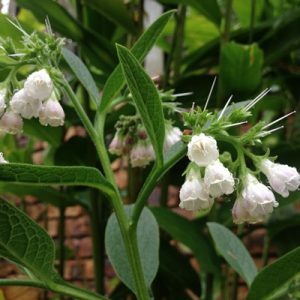 Comfrey forms a ‘grass invasion barrier’ around the vegie patch. It also doubles as a lovely green pick for the chooks. It’s a dynamic accumulator of magnesium while supplying the chooks with some calcium and potassium. All leafy greens like this help grow gorgeous golden yolks. Millet is a winter and spring grower. Its leaves look similar to a like sweet corn plant Millet seeds are often found in bird seed mixes. 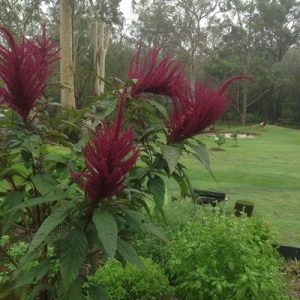 I grow it in a mix of seeds as clicker tucker for the chooks, but if one springs up elsewhere, I allow it to go to seed and feed the whole plant seeds and all, to the chooks. This is another of those plants that produce abundantly in summer. It provides us with snappingly fresh leaves for salads and spinach dishes, but the chooks really get into it. It is among the highest in protein and calcium of all leafy greens. These are a joy to have in the garden. We eat all parts of the peppery plant, and the chooks love them too. It’s a mild antibacterial for both chooks and humans. Gotukola is known as a remedy for human arthritis. I wonder if chooks suffer from the same ailment? Anyway, I pull up the flourishing excess from around the fruit trees and feed it to our hens. They enjoy it, tossing the long strings of leaves around and pecking at the leaves. For humans it’s a good tonic, helps with arthritis and inflammatory diseases including diabetes. For people the fresh ‘dose’ is 3 leaves per day. Although not the only fresh plants our chooks get for health and wellbeing, this list is a pretty good start. This is the way I sow the clucker tucker (bird seed, cow peas, beans, soy beans etc ) in the hen house. 2. 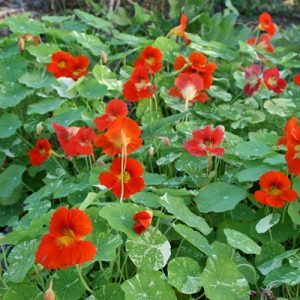 Throw seed down and rake some covering of soil or straw over, then water to begin sprouting. 3. Sit a frame or wire on bricks over the top so they can peck at the new shoots on the way through. This way they have a couple of weeks of food without scratching it all up at once.